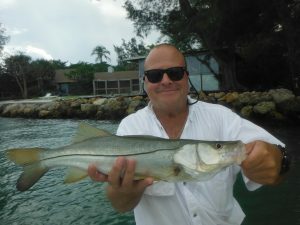 Summertime snook fishing Siesta Key, Sarasota, Florida! 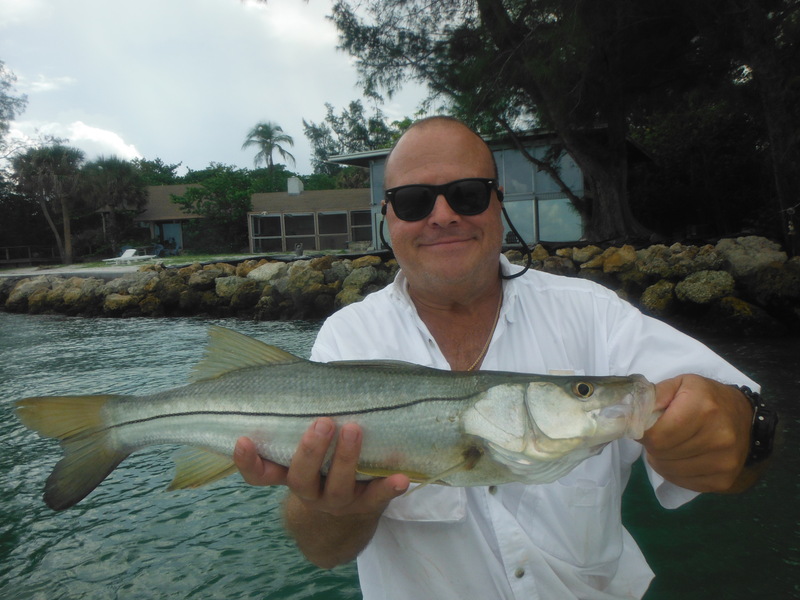 There is little doubt that snook are the premier light tackle inshore fish in our region of Florida. These predators are the perfect game fish. They strike artificial lures and flies, leap clear out of the water, and are aggressive, yet challenging. I tell my clients that snook are very similar to largemouth bass in habit but with the muscle and attitude of a saltwater fish. They have a very large mouth which allows them to inhale their prey and are almost always found near structure. Snook can be very active or infuriatingly fussy. 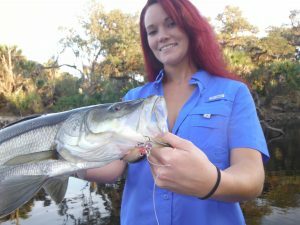 August is a great month for Sarasota snook fishing as there are multiple patterns and techniques that are productive. Snook spawn out on the beaches in the summer and there will still be fish out there in the surf. Passes will also hold concentrations of fish. Big Sarasota Pass on the north end of Siesta Key has abundant structure and deep water, making for prime snook habitat. Mangrove shorelines, oyster bars, docks, and bridges will also attract fish. Any spot that has a depth change, cover, current, and bait is likely to produce, particularly those close to the passes. 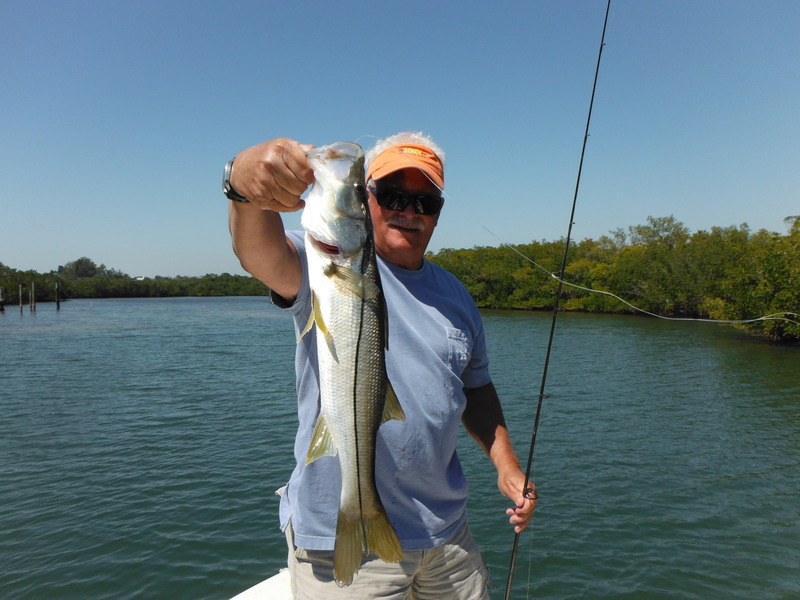 Artificial lures and live bait are both effective for anglers Sarasota snook fishing. The choice really depends on angler preference and conditions. Personally, I LOVE plug fishing! I find that making a good cast right up against the mangroves and anticipating a snook attacking it as I twitch it through the strike zone to be very enjoyable. I prefer Rapalas, with the X-Rap being my favorite. Nothing beats a surface strike; topwater plugs such as the Zara Spook and Twitching Rap are proven baits. Soft plastic baits are both versatile and extremely effective. The D.O.A. CAL series of baits is quite popular in this area. I like dark colors such as rootbeer and golden bream, especially after a bit of rainfall. A 1/8 ounce white head works well in shallow water and offers a contrast to the dark body. Heavier jig heads will be required in deeper water. When conditions are tough, scented baits can really make a big difference. Trigger-X and Gulp! both offer a good selection of quality lures. 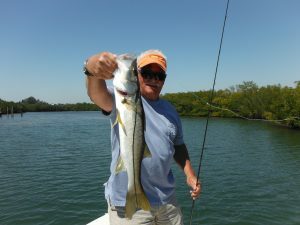 Live bait catches fish on Sarasota snook fishing charters; it is that simple, especially in the daytime. A large pilchard is tough to beat, but pinfish, grunts, and large shrimp also catch plenty of snook. Netting up a bunch of pilchards and using them to chum the fish into a feeding frenzy is a time-proven technique. Free lining baits under docks or along likely-looking shorelines is also productive. In shallow water a float will keep the bait from getting into the grass. Sometimes acquiring large pilchards can be difficult, especially in the summertime. However, 3” pinfish are abundant and are a good alternative. They also seem to catch larger fish. The equipment and rig is the same with both live and artificial baits. A 7’ rod and spinning reel spooled with braid or monofilament line is a good all-round choice. A 24” section of 30 lb fluorocarbon leader is attached to the running line, then the lure or a 1/0 live bait hook is tied on. I do not like to use swivels or other hardware. I prefer to double three feet of the running line using a Spider Hitch and attach the leader using a double uni-knot. I then tie on the hook or lure using a uni-knot. Anglers looking for numbers of fish will do well fishing lighted docks and bridges after dark. Snook are nocturnal feeders and will be active after the sun sets. Lights attract shrimp and glass minnows, which in turn attracts the gamefish. Anchoring a long cast up-current from the light and casting into the shadow line is the preferred technique. D.O.A. shrimp, jigs, flies, plugs, and live shrimp will all produce….or not. Snook can be notoriously finicky! Night fishing also gives anglers a respite from the summer sun, just be mindful of thunderstorms when Sarasota snook fishing. Sarasota offers anglers a unique opportunity; sight casting to large snook on the beach. And the best part is that not only is a boat not required, it is actually a hindrance! Snook gang up on area beaches to spawn in the summertime. These fish will often be seen inches from the surf line. Small white bucktail jigs and flies are very productive, but plugs, spoons, and live bait will also fool their share of fish. Ideal conditions are clear water, little or no chop, an incoming tide, and an east wind. West winds churn up the water making sight fishing difficult. Snook will still bite for anglers blind casting around rocks and other structure. 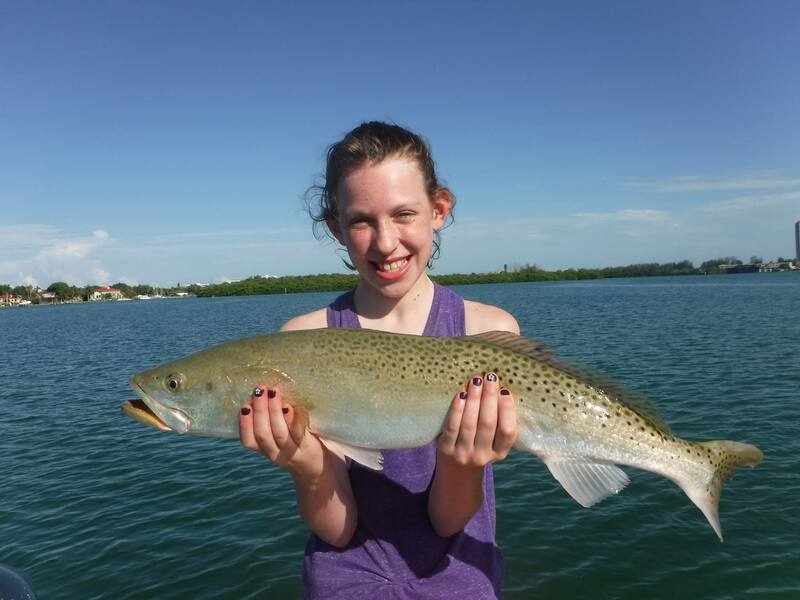 Point of Rocks near CB’s Saltwater Outfitters on Siesta Key is a terrific spot to fish! The technique is pretty straight-forward. Walking north will keep the sun to the rear, making the fish easier to spot. Stay ten feet or so from the surf, the added elevation will also assist in seeing snook. Once spotted, determine the direction that the fish are moving, and cast out in front of them. Light lures and flies will produce more bites as they result in a more subtle presentation.